NOTICE REGARDING CANADIAN DEPARTMENT OF NATIONAL DEFENCE INTELLECTUAL PROPERTY: The badges, crests and insignia of the Canadian Forces are copyright and/or trademark protected. In accordance with Chapter 7, paragraph 58 of CFP A-AD-200-000/AG-000 "The Heritage Structure of the Canadian Forces" only a Commanding Officer may authorize reproduction of the formation or unit's official badge. 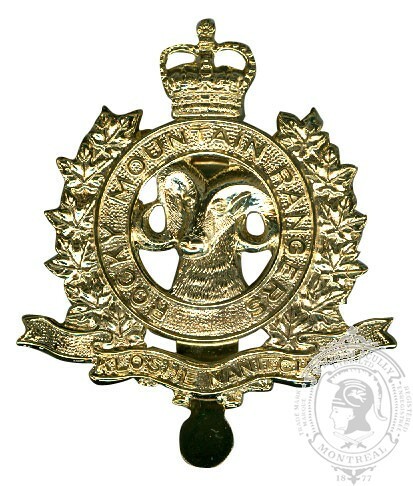 Additionally, under the authority of Canadian Forces Administrative Order 27-8 a Branch, Regimental or Group Fund may establish a kit shop to offer specialized merchandise to the Branch, Regiment or Fund. Therefore, unless an order is accompanied by a signed letter from a unit Commanding Officer or a member of the senior executive of a Branch, Regimental or Fund (or their respective delegated authorities) it will not be processed.